The spirit of challenge is basic to the NIDEC-SHIMPO culture, influencing all aspects of product development, manufacturing, and servicing our customers. All of us at NIDEC-SHIMPO, as a team, swiftly start taking action toward our goals. The practice of challenging each individual employee has helped drive and cultivate the creative ideas behind the state-of-the-art technology within our power transmission products. NIDEC-SHIMPO and its employees place quality control on a pedestal and consider it to be the ultimate goal – an ongoing challenge, where we seek continuous improvement at levels previously thought unattainable. In 1969 NIDEC-SHIMPO received “The Deming Award” for our outstanding quality control based on the Total Quality Control (TQC) Method. Since that time, NIDEC-SHIMPO’s desire to avoid causing any inconvenience to our customers, due to inferior product or service, has steered us towards internalizing a unique statistical Quality Control procedure across all departments and functional teams. Our rigid Quality Control program influences all aspects of production such as the sales and order processing activities, the design and resource allocation stages, manufacturing, and logistics. 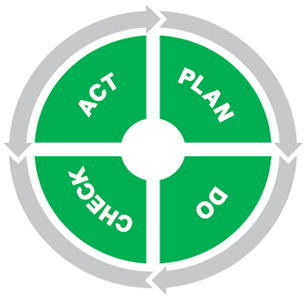 By instilling the Deming Cycles – Plan, Do, Check, Act – deep within our company culture, NIDEC-SHIMPO is manufacturing products that exceed our customer’s needs and specifications at a lower cost, faster delivery, and better service when bench-marked against any of our major competitors. Regardless if the reducer is manufactured at our main facility in Asia or assembled at our Kit Build Center in the United States; all products will be tested with the same stringent quality control procedures and tests. Lot testing a few samples, like some of our competitors do, was never an option for NIDEC-SHIMPO. All design, development, manufacturing, and repair services at our main manufacturing facility, and at our Corporate headquarters. In conclusion, NIDEC-SHIMPO will continue to challenge itself and our individual employees while striving for greater levels of product quality and services. It is a daunting challenge, as the incremental gains in quality become smaller and smaller and much harder to achieve. However, the challenge is ingrained within the spirit of each NIDEC-SHIMPO employee. This Do It Now! and Follow Through! attitude exhibited by our employees helps create superior products for the global marketplace.